1. Start on the centre of your lid, tracing a line towards the outer corner. 2. Start working the product in towards the inner corner of your lid, keeping the line as close to the lash line as possible. The line should be thinner in the innercorner and thicker towards the outer corner. 3. Now for the wing. Keep your eye open and start from the bottom corner of your lid tracing a line outwards. 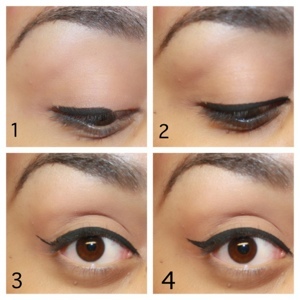 4.Connect the wing with line on your outer corner, and fill in the liner. That’s it! Always make thin light strokes and make the line thicker as you go along, and remember practice makes perfection. I never heard of starting at the center. Good tip!!! what’s the best type eyeliner for this? As a beginner I think using a gel or a cream liner for a winged eyeliner is the best, you can easy remove any misstakes with a q-tip! Thank you so much 🙂 i’m glad you liked it!